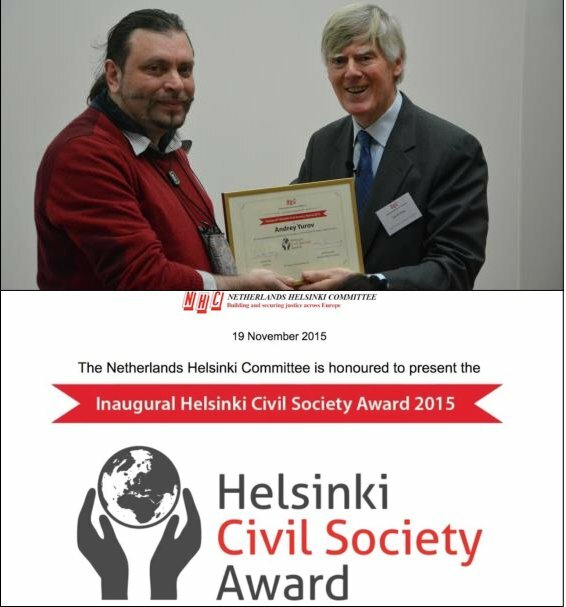 A year ago on November, 19th, 2015 the Honorary President of the Youth Human Rights Movement Andrey Yurov recieved prestigious Helsinki Civil Society Award. Today, we pulish the speech he delivered during the ceremony a year ago at the Hague. The first thing we need is solidarity of all the people defending our civilization by promoting values of humanity. It is a special honour to receive the award in the year when “post-war” world order, the world order which has placed Human Rights above national sovereignty, celebrates its 70th anniversary. 70 years ago, humanity agreed that, to be able to prevent genocides and mass human rights violations, some universalities must be put higher than governments and states. This also included solidarity in fighting against “double standards” and the approaches which valued any political or economic interests higher than the universal values. The tragic events we have recently witnessed in Paris, Lebanon, Turkey, and in the sky above the Sinai peninsula, urge us to jointly embark upon the search for systematic and humane answers to the challenges posed by violence and terror. The second thing we need is solidarity of all the governmental and nongovernmental institutions of the OSCE region in strengthening joint standards and mechanisms of Human Rights defense. Thus, it is a greater honour for me to deliver the speech in the year of the 70th Anniversary of the United Nations, and of the 40th Anniversary of the OSCE. Some 20 years ago, it could have seemed that improving Human Dimension standards was a matter of technology, not ideology. But now we know that we are still in the very beginning of the route. Not only do we see many of the Human Rights institutions failing to work properly -- what we are now becoming witnesses of is numerous attempts to revisit original approaches. This means that the fate of our region depends on the strength of our will to improve current and to establish new institutions for Human Rights defence. The third thing we need is solidarity of civil societies, their mutual help and support. This award demonstrates said solidarity on side of the civil society of the Netherlands. Thus, it is a greater pleasure for me to stand here together with Arzu whom I know for more than a decade. In the upcoming years, both courage and creativity will be needed. We will have to search for brand new approaches to the work we do, we will have to react to new challenges. Whether or not we are able to change our part of the world for the better in the foreseeable future, depends on our ability to act together for the good of Human Rights. A human being is capable of anything. There are no limits to his force, if led by the light of hope. This is very well-known to humanists, fanatics and lovers. On 22 May 2013, the charitable foundation "International Project - Youth Human Rights Movement" (YHRM), whose office is located in Voronezh Human Rights House, received a letter from the Department of Property and Estate Relations of Voronezh City Administration that breaks their lease and enjoins YHRM to leave the premises. A similar letter was received on 17 May 2013 by the Confederation of Free Labour, an interregional trade union, whose offices are also located in Voronezh Human Rights House. Anti-discrimination policies in Russia: a fairy tale or reality? On the 12th of October took place meeting of experts titled “Perspectives of anti-discriminatory politics development in Russia”. The event was organized by international Youth Human Rights Movement and United for Intercultural Action in the framework of common 3 years lasting project “Civil organisations serving society: youth actions against racism, nationalism and xenophobia and for Human Rights and inter-cultural dialogue”. During 3 days all participants together with Olga Skripnik from Center of Civil Education “Almienda” (Yalta, Ukraine) and members of Youth Human Rights Movement learnt how to assimilate media-texts by methods of organization of cinema clubs and conducting discussions after cinema shows. What is included in the definition of Hate Crimes and what is a counterpart of that European occurrence in Russia? What is treated as a crime and what not as far as hatred is concerned? Why Office for Democratic Institutions and Human Rights OSCE doesn’t treat as a crime hate speech, discrimination and genocide? What are indicators of hate crimes? All those and other questions were discussed by our participants during the seminar on prevention and reacting to hatred in St. Petersburg 1-3 of April.